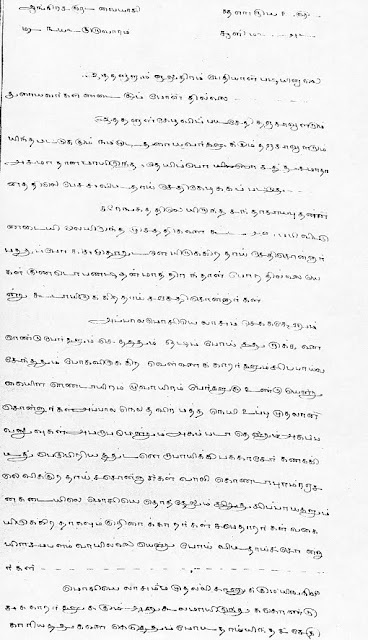 bilingual blog bilingue de la curiosité: Pillai in Tamil!/Pillai en tamil! Pillai in Tamil!/Pillai en tamil! 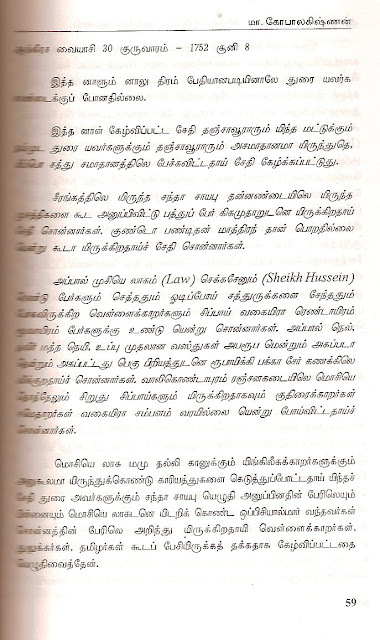 I had hoped to publish here an extract of Anandarangaillai's diary in its original language, Tamil. Thanks to the generosity of M.Gobalakichenane, a researcher residing in France and a native from Pondicherry, it's done. I am thrilled that he also contributed a scan of the manuscript which is located at the National Library François Mitterrand (shouldn't it be in India?). Very touching to see the manuscript in the beautiful Tamil script. For more precision about the manuscript, check blog entry for October 7, 2010. J'espérais publier ici un extrait de l'extraordinaire journal d'Anadarangappillai dans sa langue originale. Grâce à la générosité de M. Gobalakichenane, un chercheur résident en France originaire justement de Pondichéry, c'est chose faite! Je suis absolument ravie qu'il ait aussi contribué un scan du manuscrit lequel est préservé à la Bibliothèque Nationale François Mitterrand (serait-il mieux à sa place en Inde?). Touchant d'avoir sous les yeux le manuscrit dans cette magnifique écriture tamoul. Pour plus de précisions sur le manuscrit, référez-vous à l'issue de ce blog du 7 octobre 2010. - and the cover illustration of that publication 'Anandarangappillai V-Natkurippu Angirasa andu (1752-1753)', 2005, which shows the portrait of the famous diarist. 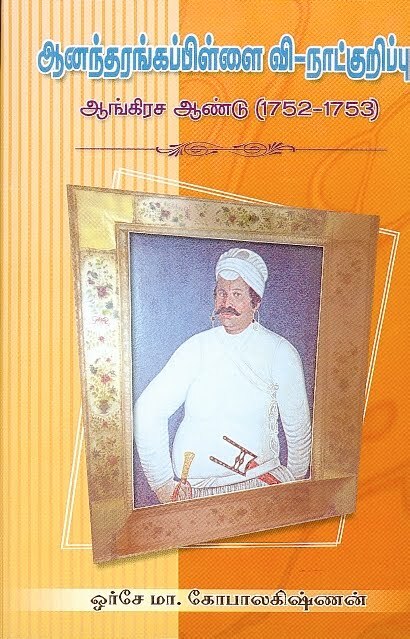 - et l'illustration de la couverture de la publication 'Anandarangappillai V-Natkurippu Angirasa andu (1752-1753)', 2005, montrant le portrait du fameux courtier. Today I didn't go neither to see the Governor because of intestinal problems. I heard today that the last inimical relations between the Tanjoreans and our Governor have gone down a little. News came that Chandâ Sâhib who was in Seringapatam had sent all men and was staying with ten 'kisumdar'. I heard also that only Gundo Pandit refused to go and stayed there. It was said also that, among Mr.Law and Sheick Hussein men, those wounded and dead together with those European and sepoys joining the enemy could number about 2 or 3 thousand. Moreover, rice, curd, ghee, salt were hard to find and the little available was acquired at very high rupees price. It was said also that d'Auteuil and few sepoys were in Vâlikondâpuram and Ranjankadai and that cavalry men and 'jamedars' went away because they had not been paid. There is news of Chandâ Sâhib's writing to the Governor, that M.Law has gone over to Muhammad'Alî Khân and the E,glish, and ruined everything. The Europeans, Muhammadans and Tamils are all saying that they have the same news from the officers who have quarrelled with M.Law. Once more I recommend reading the diary to anyone interested in the effect of different cultures meeting (Edouard Glissant! ), and in history in general. This vivid account is a window on the day to day life in the colony of Pondicherry in the 18th Century, as well as the relationship between the French and the indigenous population. Below is the link to the Columbia University's extracts in English. Je recommande vivement la lecture de ce journal à tous ceux qui s'intéressent à l'interaction de diverses cultures (Edouard Glissant!) et à l'histoire en général. Ce texte est très vivant et donne une impression unique des rapports entre Français et autochtones à Pondichéry, ainsi que la vie quotidienne dans cette colonnie. Ci-dessous le lien de référence pour la version française, plus autres liens se référant au sujet de Pondichéry. Sir, I am a research scholar dept of French, univ of madras. I am working on Lally Tollendal and i am looking for the tamil version od the Diary of Ananda Ranga Pillai Could you please help me?